The Junibacken Museum, which is in the Djurgarden area of the city, itself a very green island (Stockholm is made up of islands) housing a lot of the cities museums and attractions. Junibacken is without a doubt the best family attraction we have been to since having our girls. 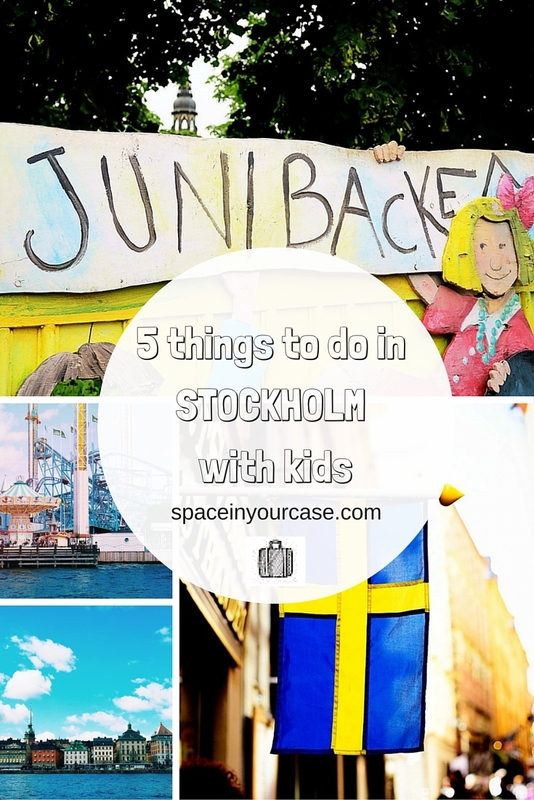 It calls itself a fantasy house and is based on the books of Astrid Lindgren who wrote Pippi Longstocking, but to be honest children don’t need to know the books to have an amazing time. It’s interactive, fun, full of play zones like slides, swings, things to climb on, and at the end you go on the Story Train which takes you on a magical fairy tale ride. There’s also a Moomins play area there too which excited us all a little too much! Also in the Djurgården area of the city is Grona Lund– a super cool, cute and kitsch looking theme park overlooking the water. There are so many different rides and attractions for children of all ages, it reminded me a little of Coney Island in the US. Make sure you go on the ‘Eclipse’ which are the highest swings in Europe at 400 feet- you get a great view of the city from there. Stockholm is made up of islands and the city is surrounded by water and canals to explore. It is best explored by boat and there are numerous boat tours that are on offer. We went on they Royal Canal boat tour where we got to explore more of Stockholm by boat. There was a audio commentary which you listed to via headphones and even my children who are really young, enjoyed listening to it, as did we for finding out more about the history of this beautiful city. I had seen about Monteliusvagen on the Visit Stockholm instagram page (which is beautiful by the way- full of hidden gems of the city) and I knew I wanted to go there. It’s basically just a viewing point of the city, but it really does give some tremendous views, but you walk up along some cobbled streets and it’s nice to go and explore. Plus you can take some gorgeous family photos as mementos of your trip. As I mentioned above Stockholm is made up of fourteen islands meaning that the ideal way of getting around is by boat, it’s as normal over there as hoping on a bus, and the ferry transport system is really easy to navigate as a tourist too. After visiting Gruna Lund we hopped on the Slussen ferry to take us over to the Old Town part of the city. This is quite a touristy part, but it is the perfect spot to people watch and have an ice cream. The ‘Old Town’ (Gamla Stan) part of the city houses a lot of the historic buildings in Stockholm and was the original city centre. It’s a beautiful labyrinth of rust coloured houses, old stone buildings and cobbled streets. The Royal Palace is there plus a whole host of galleries and museums.